The latest episode of The Walking Dead featured an easy-to-miss Easter egg paying tribute to George A. Romero’s original 1968 zombie feature Night of the Living Dead. When investigating the mysterious disappearances and subsequent murders of Saviors, Maggie (Lauren Cohan) and Cyndie (Sydney Park) happen across an abandoned house with an untamed yard now home to a battered truck and a burnt out gas pump. 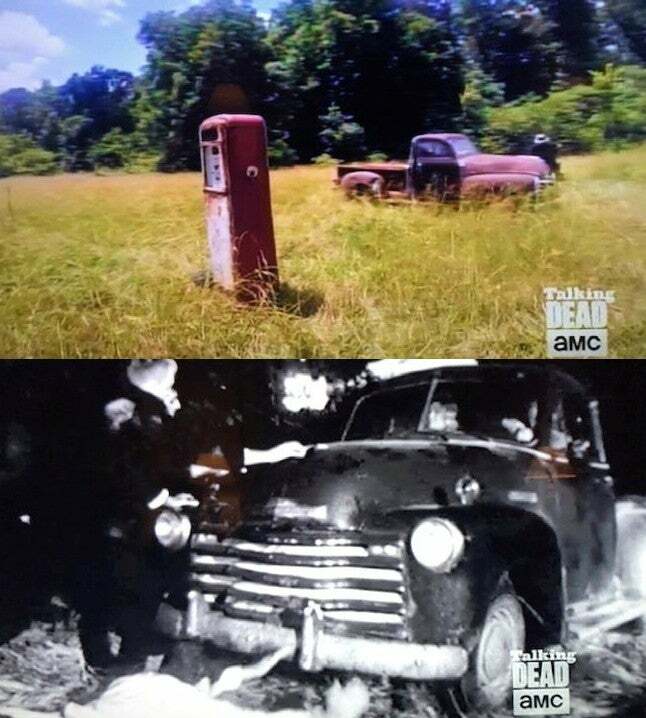 “The coolest thing to me about this location is a little Easter Egg, and this is something that Greg [Nicotero] came up with on the location scout... there’s a burnt out truck and a burnt out gas pump, and that is a homage to the original Night of the Living Dead,” VFX Supervisor Aaron McLane noted on live aftershow Talking Dead. Other notable references and tributes in The Walking Dead include a walker resembling Bub, the domesticated zombie from Romero’s Day of the Dead, and a head-splicing walker kill first seen in Dawn of the Dead.